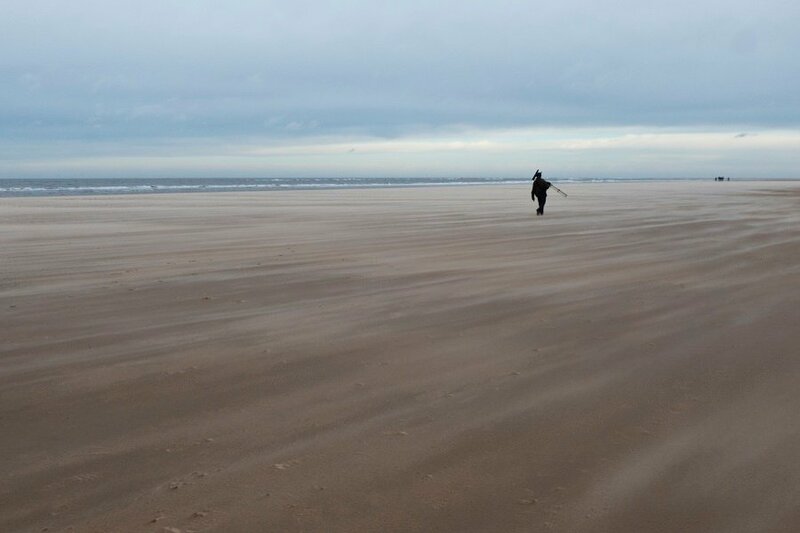 An hour on a windswept beach looking for an elusive Glaucous gull which had flown over the dunes to much excitement. You can see my husband marching across the sands with his bins and scope. Thought it would make a good rule of thirds image - although how I had the nerve to crouch down with my camera in the blowing sand after my Namibia experience, I really don't know. Love the emptiness; perfect composition! Wow! That does look cold, hubby is one very determined birder! excellent composition using the rule of thirds, dramatic minimalism and for crouching down to get such great result, you get a lot of aces for this. i like it! you might want to tag it 'theme-thirds' for the monthly theme, helen. a perfect entry, i might say. @summerfield thankyou! I meant to do that but forgot. How lovely to share a hobby, great rule of thirds and it is interesting as we can all put ourselves into the picture. Beautiful, I love walking on an empty beach, solitude. That's a vast space! Love the low pov. Did you get sand in your lens in Namibia or sandblasted? It's nice that your husband also has an interest that takes you both to such places. Nice image.